Picks: SS Kenny Vaccaro, OT Terron Armstead, DT John Jenkins, WR Kenny Stills, DE Rufus Johnson. Analysis: Vaccaro was clearly the best safety available in a strong group for that position (three went in the first round and another went with the top pick of the second round). Vaccaro has a certain confidence and edginess that coach Sean Payton loves. More importantly, he can play either strong, free or even cornerback in a pinch. Armstead walks in as a likely starter on a team that historically has gotten by with lesser offensive tackles. Likewise, Jenkins is a likely starter in New Orleans’ new 3-4 defense and is a terrific space eater … as long as he doesn’t eat his way out of the league. Posted in Saints News | Comments Off on 2013 Draft Grade ! Great way to end your career. Who Dat ! 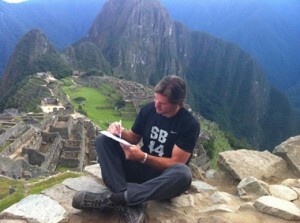 Posted in Saints News, Who Dat's | Comments Off on Great way to end your career. 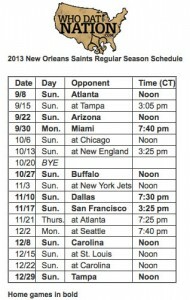 Who Dat ! 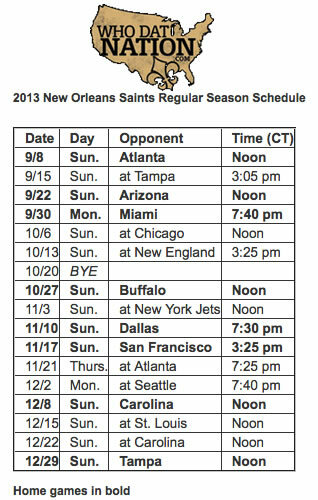 Posted in Saints News | Comments Off on 2013 Season Schedule !